When your baby is transitioning from a liquid diet to real food, a shopping cart full of glass jar pureés may seem like the easiest option. But why settle for store-bought fare? Whipping up a decidedly more healthful and flavorful first meal at home is super simple. Onehungrymama.com's Stacie Billis shares her top 9 recipes for the gummy set - you might even like some of them yourself. Combine all ingredients in a food processor or blender and blend until smooth or desired, age-appropriate consistency. Serve right away or store in an airtight container in the fridge for up to three days or in the freezer for up to three months. *Note: Blueberries are frequently ranked high on the list of high-pesticide fruits and vegetables (see the Environmental Working Group 2012 “Dirty Dozen” list). When possible, it’s best to buy organic. *Note: Peaches and nectarines are frequently ranked high on the list of high-pesticide fruits and vegetables (see the Environmental Working Group 2012 “Dirty Dozen” list). When possible, it’s best to buy organic. Combine water, orange juice, lemon juice and vanilla extract in a small saucepan set over medium heat. Add cherries and cover saucepan; cook until cherries are tender, about 15-20 minutes. Steam pear and prunes together. *Note: Though pears have fallen off of the list of most pesticide-laden fruits and vegetables (where they’ve consistently ranked in the past), 28 different pesticides are typically used on them. When possible, it’s best to buy organic. **Note: Almond meal is available at some health food stores. You can also make it by whizzing almonds in a food processor. Roasted almonds work best; a heaping handful should be enough to yield enough meal for this recipe. Though tree nuts such as almonds are a high-allergenic food, current guidelines by the American Academy of Pediatrics state that there is no proven health benefit to delaying their introduction. In a large skillet, heat olive oil over medium heat. Add carrots, onion, garlic, oregano, thyme, and bay leaf. Sautee until vegetables are soft, onions are translucent and garlic is fragrant. Add black beans and tomato. Stir to combine well and cook to bring flavors together, about 2 minutes. Add broth, brown rice, and vinegar cook for another 5 minutes. Transfer cooked beans to a food processor or blender and blend until smooth or desired, age-appropriate consistency. If necessary, add water, just a little at a time, to achieve desired consistency. Serve right away (these are great with a dollop of plain, whole milk yogurt!) or store in an airtight container in the fridge for up to three days or in the freezer for up to three months. Add oats, coconut, spices, and 1 cup of water to a medium saucepan set over medium heat and cook according to oat package instructions. Once cooked through, stir in your favorite sweetener. *Note: For kids younger than 12-months-old, I like using small amounts of natural maple or agave syrup. For eaters over 12-months-old, I prefer honey. Add basil to a food processor or blender with a couple of drops of water and pulse until it’s finely chopped, adding more drops of water, as necessary. Add fruit and blend until smooth or desired, age-appropriate consistency. Serve right away or store in an airtight container in the fridge for up to three days or in the freezer for up to three months. Heat olive oil in a large dutch oven set over medium heat. Add garlic, onion, peppers, cumin, oregano, and coriander. Sautee until spices are fragrant and onion and garlic are soft. Push vegetables to the side of the pot, creating an open space in the middle. Add tomato paste and “toast” for 1-2 minutes. Add turkey, broth, olives, raisins, and bay leaf. Cook for about 10-12 minutes, stirring occasionally, to bring all of the flavors together and all most of the liquid to cook off. Take off of hear and remove bay leaf. Separate baby portions from adult portions. Season the former with ground black pepper, if desired, and adult portions with salt and pepper. 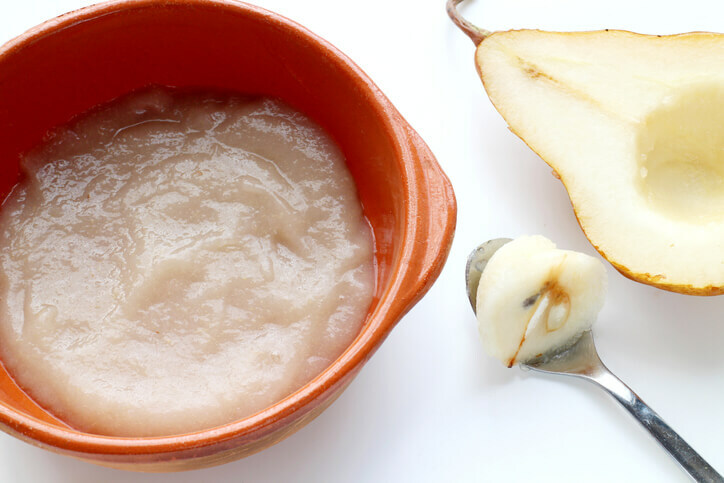 Transfer baby portions to a food processor or blender and blend until smooth or desired, age-appropriate consistency; add water if necessary to achieve desired consistency. (You can purée with brown rice or another whole grain, as well, if you like.) Serve right away or store in an airtight container in the fridge for up to three days or in the freezer for up to three months.